The US and UK have reacted angrily to the welcome given in Libya to the Lockerbie bomber, freed from prison on compassionate grounds. In the US, President Obama said the sight of Abdelbaset Ali al-Megrahi being greeted by a jubilant crowd in Tripoli was "highly objectionable". UK Foreign Secretary David Miliband said Libya would face new scrutiny. 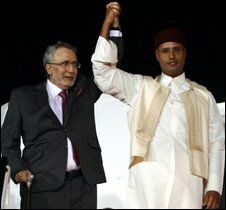 Muammar Gaddafi has yet to comment but the Libyan leader's son is said to have called the release a "victory". US and UK authorities say they have warned Libya about the sensitivity of the issue. Megrahi is believed to be resting at his family home after his journey from Scotland on Thursday. 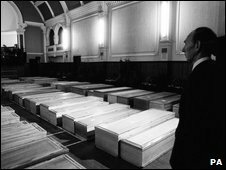 Families of American victims of the bombing in 1988, when Pan Am Flight 103 was blown up over the Scottish town of Lockerbie with the loss of 270 lives, are due to discuss how to protest over Megrahi's release and Libya's attitude. They are believed to be considering a demonstration against Col Gaddafi when he visits New York next month. A British royal visit to Libya, also scheduled for September, is being reconsidered in the light of the release row. Asked on Friday about his reaction to Megrahi's release, Mr Obama was clear in his condemnation. "I think it's highly objectionable," he told reporters at the White House. Earlier, his press secretary, Robert Gibbs, said Megrahi's homecoming scene was "outrageous" and "disgusting". The US had communicated to the Libyan government that "such a welcome sends the wrong message and is deeply offensive to the families of the hundreds of people who lost their lives in the Lockerbie bombing", the White House said. It has emerged that UK Prime Minister Gordon Brown wrote to Col Gaddafi on Thursday, asking for Libya to "act with sensitivity" in handling Megrahi's return. He also made clear that the decision to release the terminally ill bomber on compassionate grounds was the Scottish government's, a Downing Street spokeswoman said. Speaking to the BBC, UK Foreign Secretary David Miliband said: "Obviously the sight of a mass murderer getting a hero's welcome in Tripoli is deeply upsetting, deeply distressing." Libya's response would be closely scrutinised, he added. Despite the scenes at the airport, Friday saw no sign of triumphalism from Libyan ministers, the BBC's Christian Fraser reports from Tripoli. Most of Libya's newspapers are not published on Friday. However, the state-owned Al-Jamahiriyah offered an editorial condemning the conduct of Megrahi's trial and describing him as a "political hostage". Megrahi was met by Col Gaddafi's son, Seif al-Islam Gaddafi, who thanked both the Scottish and British governments for their "brave stance" although the British Government has insisted the decision to release Megrahi was a purely Scottish affair. The younger Gaddafi added in his statement that there was a "considerable amount of new evidence" to show Megrahi was innocent. In remarks carried by a Libyan TV channel on Friday, and reported by AFP news agency, Seif al-Islam Gaddafi described Megrahi's release as a "victory". "Your liberation is a victory that we offer to all Libyans," he said in the footage apparently recorded on Thursday night as he accompanied Megrahi on the flight back from Scotland to Libya. Megrahi's daughter Ghada told the BBC on Friday that her father was resting at home. "He's at home with us, he's a bit tired and worn out because it was a slightly long trip for him," she told BBC World Service. "He was overjoyed with seeing us all again." Megrahi's elderly mother, his daughter added, was "very excited and happy to see him again".